After a breakout year in 2017, Tiffany Haddish is coming into 2018 hot. You’ll be seeing the scene-stealing comedian this Super Bowl Sunday when her Groupon ad airs (you remember her amazing Will-and-Jada-on-the-swamp-tour plug during the Jimmy Kimmel show, right?). On Wednesday, Vulture published an interview in which she dished on her ideal Groupon date (it involves Trevor Noah and Michael B. Jordan) and how to finesse a selfie with Beyoncé. Kudos to Haddish for not dying instantaneously when Queen Bey paid her a compliment, because I could never survive that kind of rapture. Also interesting: Beyoncé can break up fights when she wants to. Y’all. 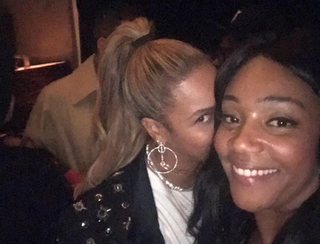 Protect Tiffany Haddish at all costs. Tiffany Haddish Kills Louis C.K. on SNL: Keep Your ‘Thang-Thang’ in Your Pants Until She Takes Her Clothes Off, Mkay?